As the consumption of the quintessential Russian alcoholic beverage falls in the country, even as whiskey gains popularity, vodka producers in Russia look to stimulate growth. According to research by the UK company Euromonitor, global whiskey sales in 2018 will be 17 percent higher than in 2013, at 920 million gallons, while vodka sales will drop by 0.8 percent, to 905 million gallons. According to the Drinks International rating, the biggest selling drink in the world is Baijiu (a vodka-like Chinese drink usually distilled from sorghum grain), with 1.3 billion gallons sold a year; vodka is second, with 925 million gallons; and whiskey, third, with 766 million gallons. "For the past 300 years, the world spirits market has been dominated by whiskey, which is the most popular alcoholic drink in the world. No other product could compete with whiskey in terms of exports. At one point, there were attempts to promote tequila as a rival to whiskey but it did not work. Vodka is the only drink that has managed to do that," says Vadim Drobiz, head of the Center for Federal and Regional Alcohol Market Research. The process started in 1981, he explains, when Sweden began to produce Absolut vodka, which later entered the U.S. market and began to gain popularity in the premium price segment. "Vodka consumption in the U.S. is currently 750 million liters [198 million gallons] a year. This is the second biggest vodka market in the world after Russia. It has grown considerably in recent years," Drobiz continues. However, vodka is catching up with whiskey on the global market largely thanks to its Western rather than Russian manufacturers. In 2013, the biggest selling vodka worldwide was Smirnoff vodka, belonging to the UK company Diageo (61.8 million gallons), followed by Absolut, belonging to the French company Pernod Ricard, which purchased the Swedish vodka maker in 2008 (28.5 million gallons). "Russian companies exported just 50-60 million liters a year, and mostly inexpensive vodkas. There are hardly any sales to countries outside the former Soviet Union. We sell no more than 15 million liters of vodka a year to the U.S.," says Drobiz. Russian vodkas are hardly to be seen on the world market, he continues. The only exception is Rustam Tariko's Russky Standart vodka, whose sales grew by 3.6 percent, to 6.3 million gallons a year. "The notion of 'Russian vodka' is being diluted. Only now are efforts to protect this brand name starting to be made. We are losing to foreign manufacturers," says Drobiz. According to the Russian Federal Statistics Service (Rosstat), vodka consumption in Russia is falling. 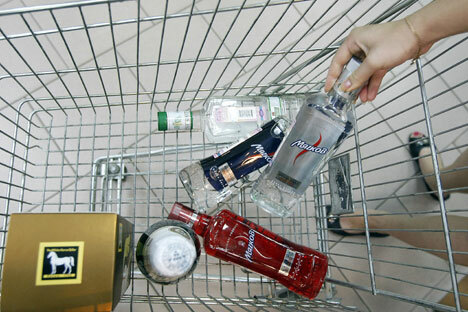 In the first five months of 2014, vodka sales inside Russia amounted to 142 million gallons, 4.8 percent less than last year. At the same time, the share of beer in Russians' alcohol consumption grew from 37.3 to 39.9 percent. Overall, Russians are drinking less. According to Rosstat, in the first five months of 2014, Russians bought 130 million gallons of alcoholic drinks (in absolute alcohol), 2.5 percent less than a year ago. In 2013, alcohol consumption was down 2.4 percent too. Having said that, Vadim Drobiz points out, it should be remembered that some 60-65 percent of the Russian alcohol market is made up of illegally produced stuff. "In all former Soviet Union countries, including Russia, Ukraine and Kazakhstan, illegal production accounts for more than half of the market," the expert says. In Rosstat's estimates, vodka production in Russia in 2013 dropped by 12.3 percent, down to 226 million gallons. At the same time, whiskey consumption worldwide is growing. According to the Distilled Spirits Council of the United States (DISCUS), whiskey sales in the U.S. in 2013 went up 10.1 percent, to $643 million. Exports of bourbon and Tennessee whiskey in 2013 were 5 percent higher than in 2012, at $1.005 billion, according to DISCUS. U.S. whiskey sales showed the fastest growth in Japan (from $22.7 to $120.8 million), Germany (from $19.6 to $140.1 million), and France (from $14.5 to $130.5 million). Can vodka keep pace with whiskey’s soaring popularity? It appears that the answer may lie in the willingness of producers to finance marketing campaigns. "One of the key drivers for whiskey sale growth are large marketing budgets of the leading transnational corporations and a demand in growing economies, which are experiencing rapid urbanization and social stratification," says Finam Management analyst Maxim Klyagin. To change this trend, he adds, a global consolidation of the vodka industry is required, together with impressive marketing budgets. "Russia accounts for about a third of global vodka consumption, however, Russian vodka brands make up only several percent of the world market,” says Klyagin. “Furthermore, a large section of Russian vodka exports go to former Soviet Union countries. Russian players can strengthen their positions only if they considerably increase investment in promotion and advertising," the expert concludes.